We had no intention of forming senior citizens' clubs, but when an interviewer spends up to twenty hours with an interviewee, they often establish bonds neither side wishes to break. 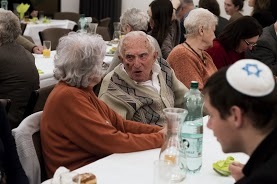 Our chief interviewer in Vienna, Tanja Eckstein, now holds monthly meetings for the single largest Jewish senior citizens' club anywhere in Central Europe, with up to 100 guests attending. In Budapest, our club meets every six weeks, and has between 40 to 60 members. They range in age from 78 to 102. Many of those in their late 80s are still working - in publishing, in string quartets, and as translators.